February is Pet Dental Health Awareness month, and vets around the world are joining in to educate dog and cat owners about why their pet’s dental health is so important and what they can do to keep their pet’s teeth clean. Dog’s lips usually cover their teeth, so while we know they’re there, we don’t often get a good look at them unless we make a special effort. We’re more aware of what those teeth might be chewing than how they’re doing. Unless our dog has seriously bad breath or has stopped eating, it is easy to overlook their dental health. But just like humans, dental health is important for dogs. It’s more than what they can chew. Poor dental hygiene in dogs leads to a build up of tartar or calculus. The hard, brownish stuff on a dog’s teeth where they meet the gum is not an inevitable part of aging. It can lead to gum disease as well as heart disease and damage to the kidneys and brain. Dogs with clean teeth and good dental hygiene generally live longer, healthier, happier lives than dogs whose owners neglect their teeth. The good news is that you can improve your dog’s dental health in just a few minutes a day. To brush a dog’s teeth, you need the right supplies. And no, he can’t borrow yours! Human toothpaste is not safe for dogs, who are far more likely to eat it than you are. And special dog toothbrushes will do a better job than those designed for humans. For smaller dogs, you can also use a finger brush, which is like a little glove with bristles for just one finger. 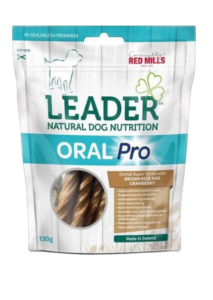 Your dog will not welcome your efforts at canine dental care, so it is best to start slow and offer plenty of rewards, such as Leader Oral Pro Dental Sticks. These Dental Sticks come in Brown Rice and Cranberry Flavour or Oatmeal and Rosemary Flavour. Don’t expect to scrub your dog’s teeth on your first session. Instead, make it a relaxed and rewarding time. Work sitting next to your dog or with him on your lap. Standing over him can be threatening and makes it harder for him to relax. Offer your dog a treat, then after he eats it, gently pet his face, rub under his chin and lift his upper lip up a little. Then give him a little taste of his dog toothpaste and follow it with another small treat. After doing that for a few days in a row, try rubbing your finger gently on your dog’s teeth. When he is reasonably comfortable with that, introduce your dog to his toothbrush. Don’t make this a play session. You want him to be calm and to hold still, not to play tug of war with his toothbrush. Put a daub of toothpaste on the brush, and gently lift your dog’s lip. Holding the brush at a 45-degree angle, brush in circles on both the inside and outside of the teeth, focusing on the gum line. If you can only do one tooth the first time, don’t worry. That is progress! As your dog gets used to you brushing his teeth, you will be able to do more and more. Dogs don’t need to rinse their mouths after brushing, but giving them a small Leader treat will make this a more pleasant experience for them and encourage cooperation. Brushing is not the only way to care for your dog’s teeth. It is vital, but you can also take some other steps in addition to brushing to keep your dog’s teeth healthy. The most basic thing is to feed your dog a heathy, balanced, dry food that gives him the nutrients his teeth need such as Connolly’s Red Mills Leader or Engage range foods, which are rich in calcium and vitamin D. Soft, wet foods can stick to your dog’s teeth, escalating the build-up of tartar. Your dog’s diet should be all or mostly hard, crunchy dog kibble (nuts) to help his teeth stay clean and strong. Chewing is a natural instinct in dogs. It is easy for us humans to take a negative view of chewing because our dogs can destroy a lot of our possessions that way. But there is a reason dogs chew – it can help their teeth stay healthy. 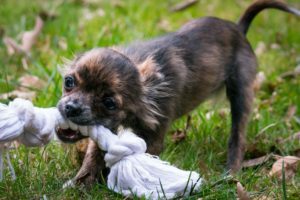 The way to help your dog indulge this healthy instinct while protecting your belongings is to ensure he has appropriate toys to chew, especially those designed to benefit his teeth. Even with the best canine dental care routine, your dog is likely to need a dental cleaning at the vet at some stage. After all, we can brush and floss twice daily but we still need to see the dentist. Your vet should check your dog’s teeth at routine visits such as when your dog gets his vaccinations. If there is a lot of tartar built up on your dog’s teeth, it would be wise to get them cleaned professionally. Home dental care will not remove that; it will slow its accumulation. If your dog’s teeth are bothering him, some of the signs he’ll give you are excessive drooling, not eating, shying away when you try to pet his head or a lack of interest in his favourite chew toys. If you see blood on his toys or in his water bowl, that’s also a sign he needs dental care without delay. While it is easier to start teaching your dog to cooperate with tooth brushing when he is a pup, it is never too late. This is one new trick even old dogs need to learn, and if you take it very slowly, it won’t be too hard. Starting late is better than never starting, and it will add quality and quantity to your dog’s life.